As I sit here writing this, I can feel pretty tired but accomplished. 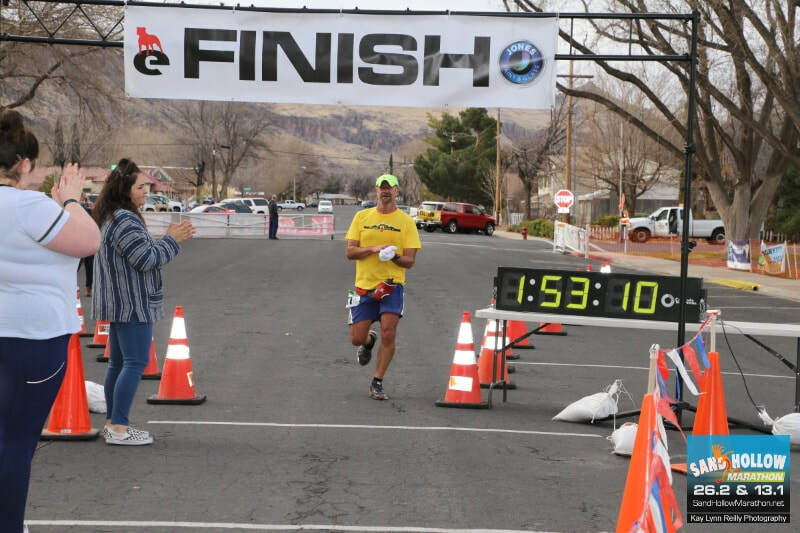 I did my own little March Madness challenge in which I did 4 half marathons on each Saturday for the first 4 weeks of March. It did, however, take a physical toll on me. I started off the month roughly running mid 40 miles per week, maybe even getting close to 50. 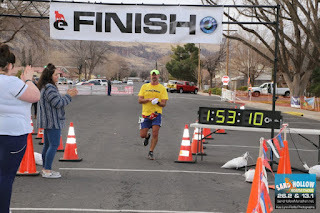 However, by the end of the month, my legs were fatigued and instead of running 6 days a week, I had cut it back to 5. I definitely overdid, but it's all good. Also what didn't help was taking a spill midway through the Lucky 13 Half Marathon for week #3. Nearly ten days later my rib still hurts and rolling over in bed is an exercise in discomfort. That is also part of the reason why my mileage is so low. Imagine trying to run with an ache in your ribs and only take half your normal breath and you pretty much what I had for the week after the Lucky 13 race. 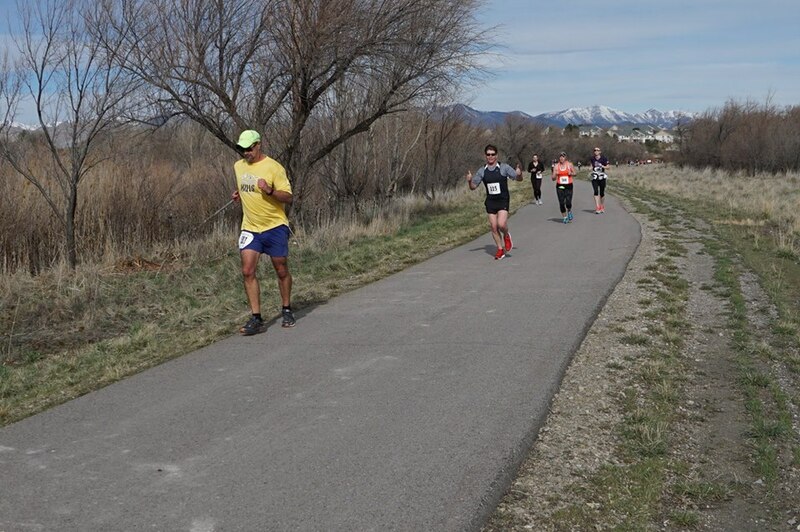 It was painful to run the Riverton Half Marathon, not only because my rib hurt, but because running 5 miles into the wind is always a humbling experience. 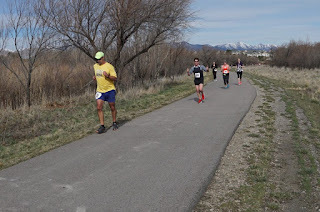 The race just about killed me as you can tell from the photo above (my form is awful and you can tell I am hurting already at mile 6ish). On the plus side, the weather continues to be deliciously beautiful (with the exception of the wind). The temperatures have been great and the days are now longer, so I can go a little further on the bike trail. Also it is awesome to see more people out running and walking their dogs. I still don't have a full marathon on the radar yet. Too much going on and my training really isn't there for a full marathon. I haven't done the "hard" training but am definitely taking advantage of being trained to do a half marathon. Finally, I have a spring destination race all set. 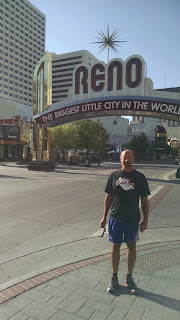 I am shooting for the Reno Half Marathon, which I've wanted to do for a LONG time. Along the way I plan on driving along Highway 50. Driving along there is a bucket list thing as someone who loves all things Nevada, I'll get a chance to visit some towns that I've only read about. I am taking some extra time to really enjoy the experience and I can't wait to do it.